Beautiful plants which are easy care and - even if they never flowered - would be a great addition to any collection. We don't always get to the plants at the right time to get a good flower photo. That's the case here. The flower is "past its prime." I'll tell you, if I were to look this good, even when I was in my prime, I'd be happy. I didn't say I would have liked to look the same, though I have friends who kind of have this look! I'll be preaching on Sunday, so I don't know if I'll get a post up tomorrow. If I don't, have a Happy Easter! We were able to get some photos today during breaks in the watering schedule. Yes we're back to feeling a bit better after another bout with whatever it was. Each of us was sick for a couple of days one after the other. But I think we've gotten past all that and we're heading full force into Spring. The above photo is a view of a tray of the plant Haworthia reticulata var. subregularis. More posts in the days ahead. Spring is definitely here! The birds wake us up in the morning, the trees are budding out, we no longer have to heat the greenhouses...and Ladybug is caught snoozing in the relative warmth of a recent afternoon. And she's starting to shed all that winter coat so that - pretty soon - she'll look like a skinny mini! These are seedlings from open pollinated Echeveria colorata plants. The coloration can be quite variable, both between individual plants and at different times of the year. These are being grown under lights. This is certainly one of the current star attractions in the greenhouse. For the relatively small plant it is, it kind of stands out and almost smacks you in the face. 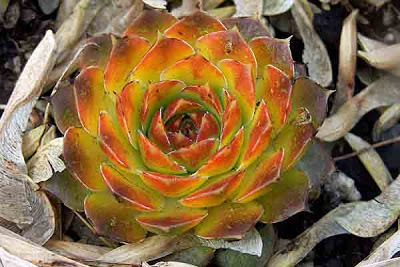 Rudolf (Lorraine) Shultz and Attila Kapitany's Echeveria Cultivars says this is a German hybrid of uncertain heritage. I've posted this before but the picture was taken at a different time of year, when the plant had more green. This plant has been totally exposed to the elements all Winter and shows it's other face, with much more red and very little green. The yellow will also become more prominent. Even when the flowers aren't available, sometimes there's the fruit, in some cases more colorful than the flowers themselves. These are no exception. This was grown from C81a seed and it appears it got some unneeded water this winter. But it seems to be doing OK nonetheless. They are amazing plants, aren't they? Obviously one of the seeds was not 'Rubra' - or perhaps a reversion - but they're doing very nicely. In the next couple of posts I'll focus on Lithops for a bit. Originally described as an Albuca (Albuca concordiana) by Baker, this fun little bulb was later transfered to Ornithogalum, though both names are used. I posted about this plant last year and there are some excellent habitat photos here. They're fascinating plants but, at least for us, slow in cultivation. This fantastic plant is native to western South Africa and northward into Namibia, growing up to 8 or 9 feet tall. Some people have found it hard to grow on it's own roots and so it is often grafted to Portulacaria afra, but we have found it to be of relatively easy cultivation, as long as it's kept dry. Rhipsalis grandiflora doesn't really have huge flowers, but they're very nice, especially as we're coming out of the winter doldrums.